Good canine care requires that owners anticipate problems and apply preventive measures to minimize the effects on their pet’s health. Arthritis affects a high percentage of dogs over the age of 8. The problem usually is caused by normal wear and tear on joints, but in some cases, genetics may play a part. Large dogs are more likely to experience joint problems than smaller dogs, and old injuries can also lead to joint degeneration and pain. If you’re getting a purebred puppy, only purchase a dog from a reputable breeder that has knowledge of any hip or elbow problems in the genetic line. Most high-quality breeders have their puppies’ hips X-rayed to ensure they have no genetic defects. 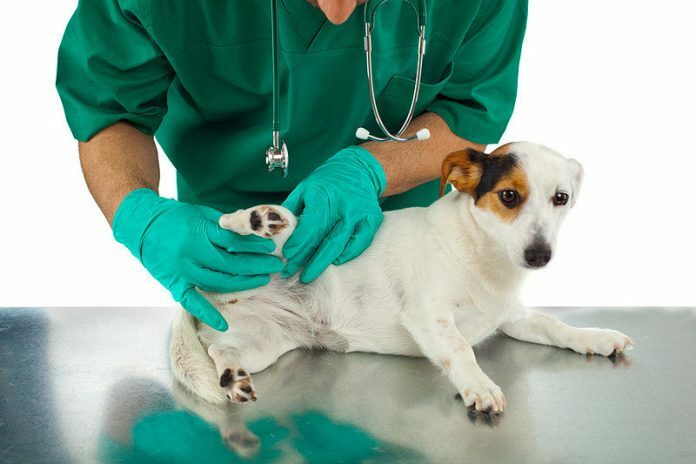 Ask for certification from the veterinarian that guarantees you are getting a dog without hereditary hip problems. One way you can protect your dog’s joints is by monitoring their exercise while he or she is still growing. Puppies love to bounce and jump, and they appear to have no limits to their physical exploits. That’s why it’s important for owners to make sure the puppies don’t overexercise, as unnecessary strain on their growing bodies can lead to joint issues later in life. Those extra pounds can put additional weight on your dog’s joints, which can eventually lead to pain and stiffness. Talk to your veterinarian about normal weight levels for your dog. A number of weight management dog foods are on the market that can help keep your dog fit and light on his feet. Unless your dog has a condition that would be made worse by exercise, you should provide a daily walk or indoor play and exercise period so they can strengthen muscles that support the joints. Provide a dog bed or thick blanket to cushion your dog’s joints on hard flooring. This measure will help to prevent additional stress on joints that can lead to osteoarthritis in later years. Position the bed away from doorways or other areas with cold drafts. Good nutrition is an important part of maintaining good health throughout a dog’s life. However, as your dog gets older and develops joint problems, you may want to ask your veterinarian about foods that contain ingredients that support joint health. In addition, a number of canine joint support supplements are available that can help to reduce inflammation and improve function in older dogs. Talk to your vet about these supplements and whether they can help your dog maintain better joint health. Dogs can be stoic about pain, and it may not be evident that your dog is experiencing any. However, if your dog is unable to jump up, takes more time getting up from a lying position, or is reluctant to engage in exercise, make an appointment with your veterinarian to find out the source of the problem. Your dog may need medication, surgery, or physical therapy to improve joint function and help him to enjoy life more. There is no way to guarantee your dog will be free of joint pain as he or she gets older. However, by following the aforementioned tips on preventing dog joint problems, you can improve the dog’s odds of having healthy joints well into its senior years.